I needed a credenza for my home office, so I made one. This is another one of my design experiments incorporating what I like from Mid century modern, and what appeals to me personally. I came extremely close to chickening out on the paint. I had the glue and clamps all ready to go and skip the paint, but I’m glad I took a chance. Finish – Pore filled with Pumice and watco teak oil (2 applications). Teak oil – which contains no teak oil is basically danish oil with UV inhibitors. I don’t want either the ash or the walnut to color shift. – Custom wiping varnish (Pure Tung, BLO, Alkid resin, solvent) – 4 coats – 3 padding sessions with 2lb cut super blonde shellac – Spit polished waxed to retain gloss – The door was shellaced, sanded, primed, then sprayed with enamel. Largely without power tools. 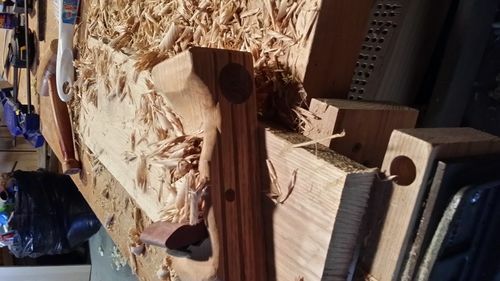 I’ve found that without a plow or rabbet plane, I can’t accurately cut housing dadoes or rabbets. 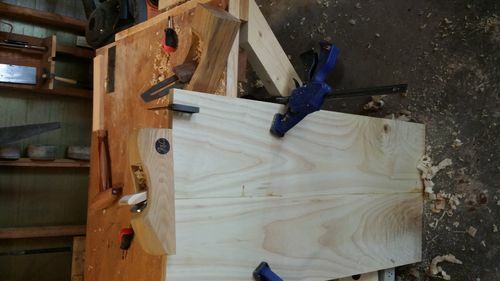 Since every board here (including the drawer fronts) have a dado, I broke down and used the table saw. Other than that, this is hand tool work. I had a lot of fun with the drawer handles. They were cut from a single piece of walnut then inlaid. 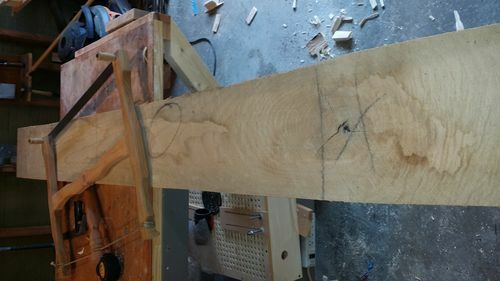 Wow, did you do all board dimensioning with hand tools? That is an incredible amount of work. 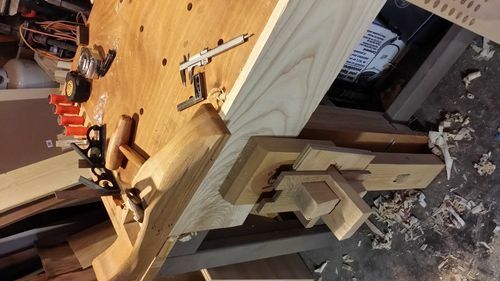 I love the wood bodied planes in your pictures, too. 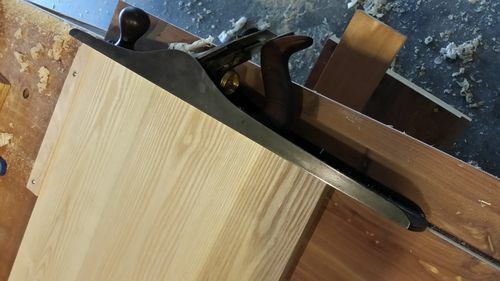 The shaping on the drawer handles is neat. Bold. Very bold. I like it very much. Lovely job. I’m not a paint fan although I’ve done some finishing with it. I’m liking everything but the paint ,but that’s me. You keep pushing the creative edge! Thanks. I think everything about this piece including the style and the paint is very polarizing. You either like it or you hate it. LOL! It’s not just your blue paint. Everytime my wife wants to paint wood I cringe. I love what nature has intended. 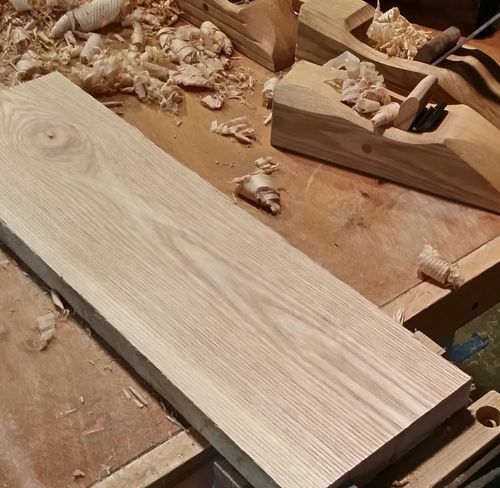 Your handles and grain matching are outstanding on this piece. Very nice, the blue looks good. It must have been very satisfying to work all that lumber by hand, great job! Nice contrast and combination of rustic and modern design. I like handles. Awesome work. I like everything about it. Nice piece. Love the pulls. Very inspiring. Thanks for posting.